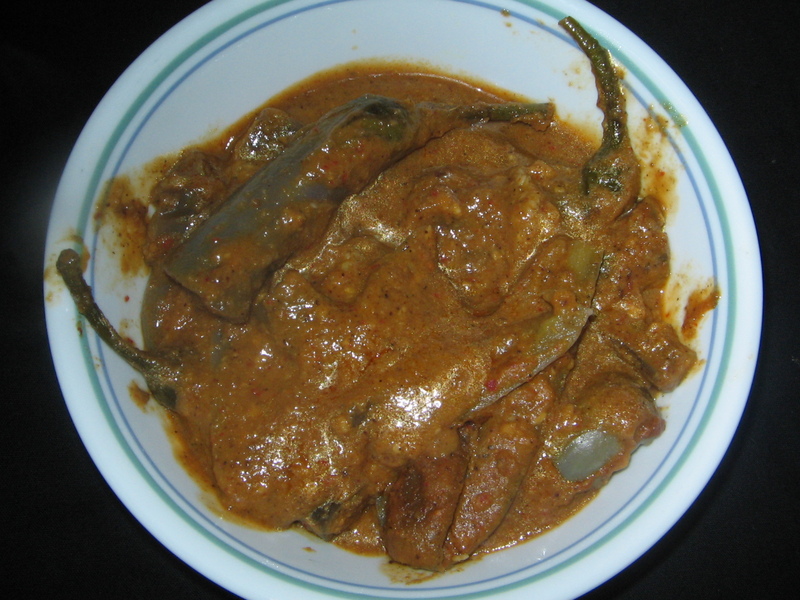 This curry is one of the most prominent delicacies from the coastal Andhra Pradesh. 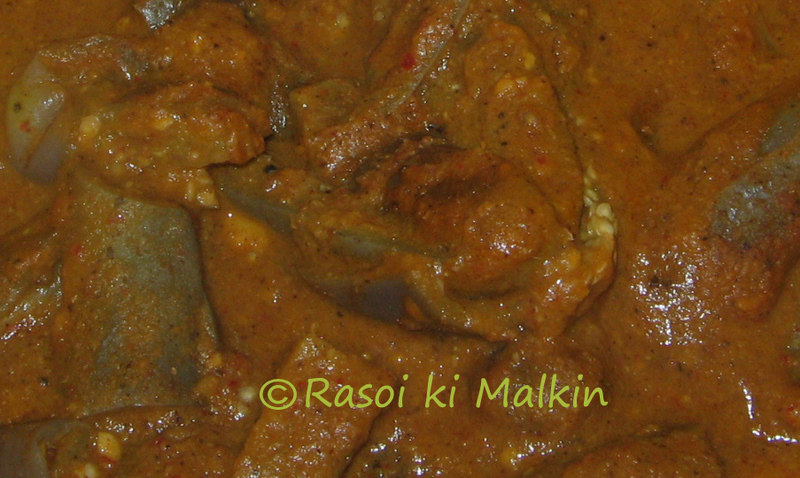 It is very tasty and goes well with rotis and rice too. Some call it as Guthhi Vankaya Masala curry and some as Nuni Vankaya. (Some call this as Bagara Baingan, but some of the ingredients differ.) This curry tastes yummy with steamed white rice along with its thick gravy. The brinjals are to be vertically splitted with the ends intact..and place them in water. Place a pan on the stove add 1 tsp oil and fry ground nuts, dhania seeds, garlic, cashew nuts, grated coconut, well. Let them cool and grind them in to a paste along with chilli powder, salt, tamarind paste /tomato paste, onion and jeera. Place a pan on the stove and add 2 to 3 tbsp oil,.. Mean while stuff the ground mixture in the Brinjals. 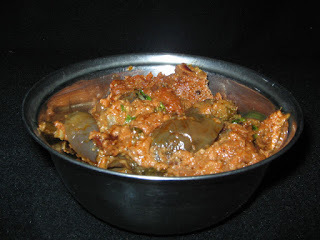 After heating the oil in the pan for 2 to 3 minutes, place the stuffed brinjals in the pan, add 1 cup of water and cook in a low flame with the lid covered until done..
Stir in between to ensure that the masala is evenly cooked without getting burnt. It will take up to 40 minutes in low flame. Transfer into a serving bowl and serve hot with rice. Place a micro safe bowl,add 1 tbsp of oil to it,and also add the stuffed brinjals and 1 cup of water.Mix well and place in micro high 900 W for 4 minutes. Remove outside and mix well, now micro at 540 W say 60% for 15 minutes, remove it outside.Stir it every five minutes. Lastly mix well and sprinkle 1 tbsp of water(if u want more gravy type add a little more water) and micro low at 180W for 5 more minutes. If u want it softer microwave it for 2/3 minutes extra. Stuffed spicy brinjal is ready to eat. thanks for sharing both the method.Perfect one. lovely masala stuffing for the brinjals. would love this with roti..
wow what a tempting looking curry!! very tasty! nice tip on cooking in microwave. hot n spicy curry...this one s a keeper..
Pongal Wishes to you and your Family!